len = impzlength(b,a) returns the impulse response length for the causal discrete-time filter with the rational system function specified by the numerator, b, and denominator, a, polynomials in z–1. For stable IIR filters, len is the effective impulse response sequence length. Terms in the IIR filter’s impulse response after the len-th term are essentially zero. len = impzlength(sos) returns the effective impulse response length for the IIR filter specified by the second order sections matrix, sos. sos is a K-by-6 matrix, where the number of sections, K, must be greater than or equal to 2. If the number of sections is less than 2, impzlength considers the input to be the numerator vector, b. 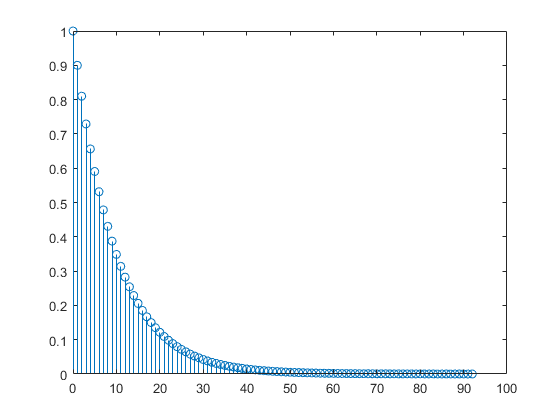 Each row of sos corresponds to the coefficients of a second order (biquad) filter. The ith row of the sos matrix corresponds to [bi(1) bi(2) bi(3) ai(1) ai(2) ai(3)]. len = impzlength(d) returns the impulse response length for the digital filter, d. Use designfilt to generate d based on frequency-response specifications. len = impzlength(hs) returns the impulse response length for the filter System object™, hs. You must have the DSP System Toolbox™ software to use impzlength with a filter System object. len = impzlength(___,tol) specifies a tolerance for estimating the effective length of an IIR filter’s impulse response. By default, tol is 5e-5. Increasing the value of tol estimates a shorter effective length for an IIR filter’s impulse response. Decreasing the value of tol produces a longer effective length for an IIR filter’s impulse response. Create a lowpass allpole IIR filter with a pole at 0.9. Calculate the effective impulse response length. Obtain the impulse response. Plot the result. Design a 4th-order lowpass elliptic filter with a cutoff frequency of 0.4π rad/sample. Specify 1 dB of passband ripple and 60 dB of stopband attenuation. Design the filter in pole-zero-gain form and obtain the second-order section matrix using zp2sos. Determine the effective impulse response sequence length from the second-order section matrix. Use designfilt to design a 4th-order lowpass elliptic filter with normalized passband frequency 0.4π rad/sample. Specify 1 dB of passband ripple and 60 dB of stopband attenuation. 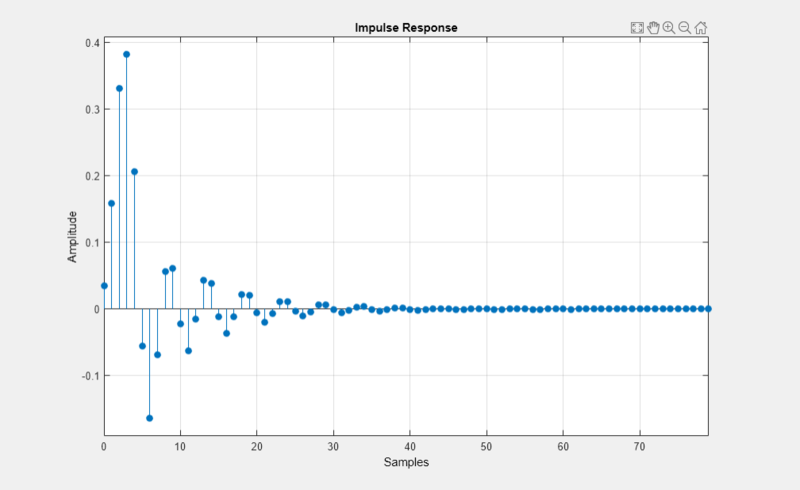 Determine the effective impulse response sequence length and visualize it. This example requires DSP System Toolbox™ software. Design a 4th-order lowpass elliptic filter with a cutoff frequency of 0.4*pi rad/sample. Specify 1 dB of passband ripple and 60 dB of stopband attenuation. Design the filter in pole-zero-gain form and obtain the second order section matrix using zp2sos. Create a biquad filter System object™ and input the System object to impzlength. Design IIR Butterworth and FIR equiripple filters for data sampled at 1 kHz. The passband frequency is 100 Hz and the stopband frequency is 150 Hz. The passband ripple is 0.5 dB and there is 60 dB of stopband attenuation. Obtain System objects for the filters and compare the filter impulse response sequence lengths. Numerator coefficients, specified as a scalar (allpole filter) or a vector. Denominator coefficients, specified as a scalar (FIR filter) or vector. The coefficients in the Kth row of the matrix, sos, are ordered as follows. Using impzlength with a filter System object requires the DSP System Toolbox software. Tolerance for IIR filter effective impulse response length, specified as a positive number. The tolerance determines the term in the absolutely summable sequence after which subsequent terms are considered to be 0. The default tolerance is 5e-5. Increasing the tolerance returns a shorter effective impulse response sequence length. Decreasing the tolerance returns a longer effective impulse response sequence length. Length of the impulse response, specified as a positive integer. For stable IIR filters with absolutely summable impulse responses, impzlength returns an effective length for the impulse response beyond which the coefficients are essentially zero. You can control this cutoff point by specifying the optional tol input argument. To compute the impulse response for an FIR filter, impzlength uses the length of b. For IIR filters, the function first finds the poles of the transfer function using roots. If the filter is unstable, the length extends to the point at which the term from the largest pole reaches 106 times its original value. If the filter is stable, the length extends to the point at which the term from the largest-amplitude pole is tol times its original amplitude. If the filter is oscillatory, with poles on the unit circle only, then impzlength computes five periods of the slowest oscillation. Five periods of the slowest oscillation. The point at which the term due to the largest pole is tol times its original amplitude.